The clacking of the skates on the track is an unmistakable sound: with it comes ten skaters, two of whom—the point-scoring jammers—are pushing their way through, dancing around, or jumping over the edges of the blockers that stand in their way. Seconds later, they all have skated further around the track, surrounded by a cloud of whistle-blowing referees. If this seems like an odd start a story for Mother’s Day, it probably is…if we were anywhere other than The Hangar, the home of Portland’s Rose City Rollers.  Ranked the number one roller derby league in North America and the number two league in the world, Rose City Rollers is home to over 550 skaters ranging in age from 7 to 55 and supported by about another 500 volunteers. Within Rose City Rollers’ ranks are mothers, children, siblings, spouses, and significant others. Give the holiday, we thought that we’d take a moment and ask some of our mothers—current or former skaters, or the mothers of our current skaters—how derby has shaped their lives, or the lives of their children. From them, we hear stories about body positivity, community and connection, and seeing one’s child grow with and through the sport. Robyn Liu is a medical doctor and who formerly skated with Rose City Rollers’ recreational league, the Wreckers, under the name Lioness. Now she cheers her daughter, who skates under the derby name of Square Not, on from the bleachers. Once Square Not started skating, though, things changed. 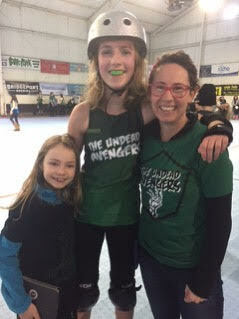 Leslie Pierce, who skates for the Rose City Rollers’ Wreckers under the name ManaTease, is mother to the now 12-year-old Screamsicle. 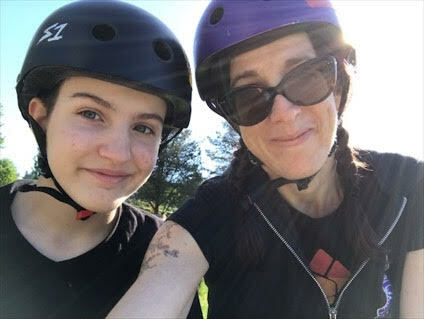 For Leslie, roller derby has been as much a matter of personal growth as it has been watching her daughter continue to grow into a strong and adventurous kid. 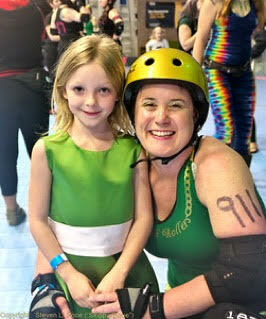 Leslie Pierce and Screamsicle trackside at a recent roller derby bout. Fast forward three years to today. This sense of community and closeness is not limited to Screamsicle and her teammates. As a mother to a non-binary child, the community in and around roller derby impressed Newell. Bettie Newell and Alexander Slamilton at the Skate Park. This sense of empowerment is not limited or felt by Slamilton alone: last summer, Newell, along with “some of [her] favorite derby mamas,” started Rose City Rollers’ Derby 101 program because it looked like fun. Nearly a year on, roller derby has had as much of an effect on her as it has had on Slamilton. Sharon Ferrier, who is better known as Maye Daye with the Rose City Rollers community, has a slightly different perspective: in addition to playing roller derby since 2012 and skating with the High Rollers since 2014, she sits on the Rose City Rollers’ Board of Directors and coaches the Killer Bees, one of Rose City Roller’s four teams for skaters aged 7-12. Her daughter, T.N.T., was just drafted onto a Petals Team—the league for 7-12 year olds—after successfully completing the Butterflies Program, which prepares young skaters for increasingly competitive play. “Throughout the past year, I have learned so much about them, myself, and how roller derby can be used at every level to guide discipline, self-confidence, and supportive communities,” says Ferrier. No small part of Ferrier’s success and satisfaction comes from Rose City Rollers’ relationship with organizations like the Positive Coaching Alliance. Rose City Rollers, like every roller derby league, strives to ensure that its skaters’ experience on the track supports their physical and emotional growth. Sharon Ferrier and T.N.T. smile for the camera after a bout at The Hangar. As the mother of a young skater, Ferrier does not just see the power of this persistence in young skaters at the track; she also sees it in her daughter. “Keep making it better” is one of Rose City Rollers’ core values. If you would like to know how you or someone you love might get involved roller derby, check out Rose City Rollers’ aptly-named Get Involved page. If you have never been to a roller derby game, you can see all of our upcoming bouts on our Events page. If you don’t live in the Portland-area, there are over 400 World Flat Track Derby Association-affiliated roller derby leagues around the world.